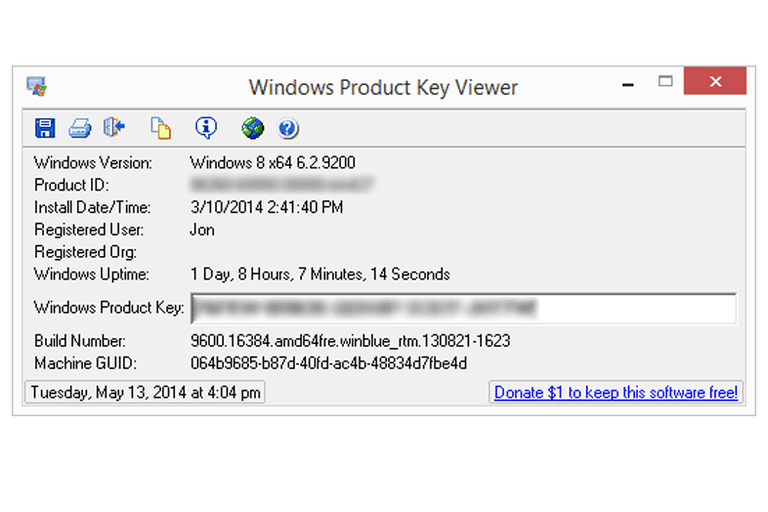 Windows Product Key Viewer is, as you've probably guessed, a key finder program for Windows. Lots of Windows versions are supported and a few additional operating system details are shown. The program is portable and lets you copy the product key straight out of it, export it to a file, or print it off. This review is of Windows Product Key Viewer v1.07, which was released on August 7, 2015. Please let me know if there's a newer version I need to review. Windows Product Key Viewer is a perfect tool for finding the product key in any version of Windows. In addition to the product key, Windows Product Key Viewer also displays the registered user and organization, system uptime, Windows version number and product ID, machine GUID, build number, and install date. However, while it may sound cluttered, the product key is clearly shown in the center of the program, so it's not at all confusing to find. Something I don't like is that while you can copy the product key out of the program and to the clipboard, when you choose to save or print the key, it includes everything else the program finds, such as the product ID and machine GUID. Because Windows Product Key Viewer is so small in size, it's actually perfect for storing on a flash drive, which is great idea if you plan on using it on multiple computers. Try a different free key finder program or maybe even a premium key finder tool if you were unable to find what you needed to with Windows Product Key Viewer.